Did you know a small egg packs a big punch when it comes to weight loss? In one study, those who ate an egg breakfast as a part of a calorie-restricted diet lost more weight than those who had a similar eating pattern, but ate a bagel for breakfast instead. But adding this food to your diet may not be enough. You need to know the best ways to make eggs part of a healthy eating regimen. Do Eggs Help You Lose Weight? Does an egg breakfast contribute to weight loss? That question was what researchers set out to answer in a 2008 study. The study compared people who ate energy-deficient diets with either a bagel breakfast or an egg breakfast. The breakfasts consisted of the same number of calories. Two other groups added eggs and bagels to their current diets without changing anything else. After only eight weeks, those in the egg breakfast group lost 65 percent more weight compared to the bagel breakfast group. Those in the free-eating groups did not experience significant losses. Additionally, those in the egg breakfast group lost, on average, 16 percent body fat compared to the other groups. Losing body fat is more important for health than just losing weight because free-moving fat in the body contributes to heart disease and strokes. Having a higher body weight could mean you’ve gained muscle and lost fat, which would be healthier than having more body fat. Eggs are also listed as a 0 point food in the Weight Watchers program. Another study of adult men in 2010 showed those who ate an egg breakfast were less hungry by their next meal and ate fewer calories over the next 24 hours compared to those who consumed a bagel breakfast. Though the two meals had similar calories, the ones in the former group had fewer blood glucose variations and less of the hunger-inducing hormone ghrelin in their systems, compared with those in the bagel breakfast group. A study of preschool children showed those who ate a high-protein breakfast had better diets overall. When consuming the high-protein breakfasts, they consumed 65 fewer calories on average, but their satiety after their morning meal was the same. Eating a higher density of protein, while keeping the protein amount the same, resulted in increased feelings of fullness. Though the study did not specify the exact composition of the high-protein breakfast, eggs are a way to increase the protein in your diet in an easy-to-prepare food that is suitable for a wide range of appetites. In 2016, another group of researchers examined the effects of a protein-packed breakfast on older children, ages 8 to 10. This study showed children who consumed an egg breakfast compared to a cereal or oatmeal breakfast ate fewer calories at lunch. After lunch, though, intake for all three groups was similar. If you want to help your children eat healthier, serve them a high-protein breakfast instead of cereal or oatmeal. While they will likely still eat as much at dinner, they may eat less at lunch, helping them naturally keep their weight in check without actively dieting. Eating a high-protein diet, such as an egg-based one, could help you burn more calories. The energy your body burns to digest your food is called meal-induced thermogenesis. Those who ate a high-protein diet had higher thermogenesis than those consuming a high-carbohydrate diet. The researchers conducting this study surmised that burning more energy to digest high-protein meals could be the reason people lose weight on high-protein diets. High-protein breakfasts can help all age groups eat less later in the day, but should you eat eggs daily? How much is too much when it comes to this food? As with all foods, portion control is essential. While adding eggs to a healthy diet can be helpful, you can have too many. Despite the amount of cholesterol found in yolks, if you consume a lot of cholesterol in your diet, the liver reduces the amount it makes, evening out your blood levels. Only about 30 percent of people from one study had sensitive reactions to dietary cholesterol affecting their blood cholesterol levels. Most healthy people, though, could eat up to three whole eggs daily without the change affecting their blood chemistry negatively. Though your doctor may clear you to eat a daily egg-based breakfast, use caution if you want to lose weight. Calories still matter when you’re trying to shed pounds. If you typically eat a 400-calorie breakfast in the form of a bagel or cereal and switch that for a three-egg meal, you could lower your morning intake to 240 calories, which is the amount in three hard-boiled eggs. In the study of those who consumed eggs or bagels, only those who ate an egg breakfast as a part of an overall reduced-calorie diet lost weight. Make sure you’re cutting calories throughout the day, not just adding more food. Is It Bad to Eat Eggs Every Day? Eating eggs daily is fine, but you need to be mindful about what you eat with your meals. Having a side of bacon or sausage with your breakfast every morning adds extra fat and calories to your diet. Eating white toast contributes carbs, but not much fiber. If you want to make the most of your meals, add vegetables or fruits, and use healthy cooking methods for preparing your main dishes and sides. Eggs have many benefits for your health, and people who consumed between one and three whole eggs daily had improvements in several areas of health. Their HDL, good cholesterol, increased and they had significant rises in the levels of the antioxidants zeaxanthin and lutein. These antioxidants help prevent eye conditions such as cataracts and macular degeneration. Choline found in high amounts in eggs helps cells perform vital functions, and the protein helps your body build muscle. When developing an egg-based diet, the best options are products that came from chickens who ate foods rich in omega-3s. These high omega-3 products help your body absorb fat-soluble vitamins. In addition to absorbing vitamins, omega-3 fatty acids may prevent heart disease, arthritis, and cancer while improving circulation. The human body needs omega-3s, but does not produce them, which is why consuming foods with this naturally occurring fatty acid is essential, especially if you are changing your diet for the better. Enjoying a single boiled egg a day helped the overall health of Japanese women in a 2018 study. The women consumed the same number of calories each day during the study as they did before. However, while participating in the survey, their cholesterol and protein intake significantly increased. Despite eating more cholesterol, their proportion of LDL, the bad cholesterol, dropped. Additionally, folic acid in their blood increased, they ate fewer sweets, and their overall diets improved. This study proves you can eat eggs daily as part of a healthy lifestyle. One reason some people avoid eggs is they don’t know how to cook them. You can overcook them or use the wrong method and make them unhealthy. But with the right cooking methods, you can enjoy egg recipes that fit every part of your day. To keep your dishes low in calories and saturated fats, use simple cooking methods. The bonus of choosing these less complicated cooking methods means you will have more time to devote to the things that matter in your life. Boiling requires no added fat, making the result healthier. What makes this option unhealthy is when people devil eggs with mayonnaise-based fillings or mix them into mayonnaise-based salads. A simple hard-boiled, sliced egg is a good-for-you protein alternative to meats on sandwiches and salads. If you prefer a soft, jammy center you can dip toast points into, you will want a soft-boiled yolk. The only difference between these types is how long you cook them. Start with a large pot and place the eggs in the bottom, so they don’t overlap. Fill the cooking vessel with cold water to cover the eggs and set over high heat to boil. Shut off the heat once the pot reaches a boil and remove the pan from the stove. Set a lid on top and begin timing until you reach the desired cooked level. Soft-boiled: Time for three to four minutes to reach soft-boiled status. Use less time for runnier centers and set whites. Medium: Leave the pot covered for six minutes if you want creamy, barely set yolks. Hard-cooked: Leave the pot covered for eight to 12 minutes for hard-cooked results. Do not leave the pan covered longer than this, or you could get a greenish ring around the yolk. At eight minutes, the yolks will still have a slight creaminess to them but be mostly set. By 12 minutes, the yolks will be cooked solid all the way through. At this firm-yolk stage, you can slice the finished product. Poaching is like boiling without the shells. Because the eggs don’t have the protection of their shells during cooking, you need to use barely simmering water and treat them gently. Use the freshest eggs possible for best results. Despite the rumors you might have heard about adding vinegar or salt to the poaching liquid, avoid these additions because you can affect the taste of the delicate whites. If you want to use a more flavorful liquid, however, you can do so for slightly tinted and flavored whites. Tomato juice, wine, soup broth, and milk all are tasty poaching liquids. Simmer two to three inches of liquid in a pot. Crack each egg into a cup, and slip it from the container into the water. Cook each individually in the liquid for three to five minutes. Never stir the cooking water or otherwise disturb the liquid. Lift the egg gently from the liquid using a slotted spoon and allow it to drain before serving. Do not use poaching as a means of cooking ahead of time, as the results do not keep well. Serve them at once. While using water-based cooking methods is the healthiest option, you will need oil for frying or scrambling. Avoid using butter or bacon fat. Yes, both of these fats add fuller flavor, but these animal fats are not as heart-healthy for you as vegetable-based fats. If you want to make a dish with butter or bacon fat, feel free to do so on special occasions. However, for daily consumption, stick to healthier oil, such as olive oil, which has less saturated fat. To increase the healthfulness of your dishes, add vitamin, protein, or fiber-filled additions. Choose vegetables, lean meats, and low-fat cheeses to make your recipes taste great while contributing to your overall diet. To make your preparation easier, use leftovers from your dinner. Even a small amount of bacon crumbled in an egg dish is a healthier option than eating several slices as a side. This option satisfies your craving without derailing your diet. If you don’t want to mix in vegetables, serve them as a side dish to increase your servings for the day. The protein in the eggs and the fiber from the veggies will help you stay full. What you serve with your egg-based dishes determines the healthfulness of your choices as much as how you cook them. When preparing any meal, always follow the recipe carefully. Use a timer to ensure you don’t overcook the eggs. Even a minute can make the difference between soft-boiled and medium, or hard-cooked and overdone. Overcooking does not make the dish taste better, and some people dislike the texture. Whether you choose to poach, boil, fry, bake, or scramble, time the dish correctly to ensure you get a well-cooked recipe that has a quality taste and texture. Eggs are an incredible food. There are so many ways to cook them that you can enjoy them daily and rarely repeat recipes. Don’t forget to stick to low-fat cooking methods to keep your dishes healthy. Here are some of the simplest, tastiest ways to prepare your meals to help them fit into your weight-loss plan. Scrambling is one of the easiest ways of cooking eggs. You only need a nonstick pan and a little healthy oil. Additionally, this cooking method adapts well to add-ins. If you have leftovers from dinner, toss them into the cooking dish to change up your breakfast. Scrambled whites with chicken: If you want to lower the fat intake in your diet, use whites instead of whole eggs. This recipe flavors the dish with chicken, Parmesan, and basil. Use leftover baked chicken breasts or rotisserie chicken to make preparing this recipe even easier. Sofrito scramble: You don’t have to stick to whites to eat healthfully. Take this recipe for sofrito scramble, for instance. It uses whole eggs and a flavorful sofrito sauce to create a filling dish you can serve at any time of the day. Poaching takes a little talent, but the skill is not difficult to master. Once you get the knack for it, you may find yourself adding poached eggs to the top of vegetables, salads, and toast. Mushroom spinach benedict: Though you may think of the richly sauced benedict breakfast as a less-than-healthy choice, this recipe swaps out the heavy sauce for flavorful mushrooms and nutrient-rich spinach. You get a serving of vitamin and fiber-packed vegetables and whole-wheat English muffins to start the day or as a part of a hearty dinner. Poached eggs with greens and brown rice: Who said eggs were only for breakfast? This savory and healthy recipe stands in for a meat-laden dinner. Brown rice and bok choy boost the fiber in this recipe without sacrificing flavor. It’s a light, filling dish that takes minutes to make and only contains 227 calories per serving. Omelets look appealing on the plate and are easier to prepare than you think. Like scrambling, omelet recipes adapt well to incorporating leftovers you may have. Easy classic omelet: For a fast, effortless way to learn to make omelets, prepare this recipe. It will get you 50 grams of protein from one meal, and you can have it ready to eat in just 15 minutes. Avocado-kale omelet: You won’t have to worry about folding an omelet with this recipe topped with avocado and kale salad. Swap out the toast in your avocado toast with an egg to make a high-protein, low-carb breakfast that will keep you satisfied. Hard-cooked eggs add flavor and protein to more than salads and deviled dishes. Discover new ways to incorporate hard-boiled eggs into your routine. To make these recipes even more straightforward, use pre-boiled. Our beet and Buffalo-flavored boiled eggs enhance the taste of any dish. ELT: Replace the bacon with a sliced, hard-boiled egg in a BLT recipe for a healthier lunch option. Make the most of this recipe by using high-quality tomatoes and whole-wheat toast for more fiber. Serve this sandwich with a salad or freshly steamed vegetables for a filling lunch. 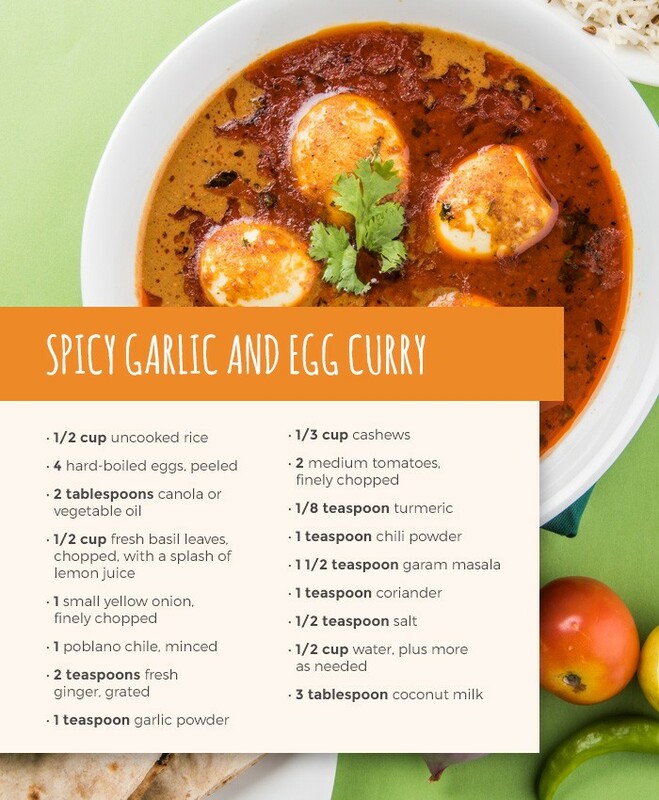 Spicy garlic curry: Add a little spice to your life with this Indian-inspired curry dish featuring eggs. This dish is perfect for a meatless dinner that does not compromise on taste. The exotic spices of garlic, coriander, turmeric, chili powder, and garam masala will take your taste buds on a trip overseas when you make this dish that serves a family of four. Yes, you can bake eggs. These recipes take much of the effort out of preparing this food because many require you to place the ingredients into a baking dish and slip into a hot oven until done. Breakfast tomatoes: This recipe for breakfast tomatoes is easy to make and has less cleanup, thanks to the use of tomatoes as cooking vessels and edible bowls. Because the dish has such a short, simple ingredient list, use high-quality olive oil and Parmesan. If you want to reduce your salt intake, use fresh basil or chives instead of the salt for more flavor. Stuffed potatoes: Forget filling up your baked potatoes with sour cream and butter. Baking them with bacon, eggs, and cheese turns the simple potato into a hearty, protein-filled dinner. Feel free to make substitutions to the recipe to suit your tastes. You can use chopped ham or chicken instead of bacon, or make these potatoes completely meatless. It’s up to you. Like many foods, you can incorporate eggs into your diet strategy. They are high in protein and cost less than other protein-rich foods. With so many ways of cooking, you will never run out of ways to enjoy these tasty treats. To ensure you get the most from your meals, choose high-quality eggs, like those from Sauder Eggs. We have everything from traditional white and brown to organic and free-range. You haven’t fully enjoyed breakfast until you’ve tried your favorite recipes with our specialty, omega-3-enriched Gold Eggs. Find our products at your nearest location by checking out our online store locator. Accomplish your healthy living goals by adding eggs for weight loss into your current diet.